Crossposted at streets.mnand transportationist.orgPhotos of skyways by author from Sydney (2), Portland (2), Minneapolis (3), Tokyo (1), and Harrogate (1) respectively. “The following post shares a similar argument as an article I wrote four years ago for the Downtown Journal (in Minneapolis). I was chastised at the time and suppose I will be again. However, with the recent opening of a new, $3 million skyway link to better connect the Accenture tower to adjacent blocks, as well as the new Downtown 2025 Plan taking on the “Skyway Paradox,” I was persuaded to bring it up again. I don’t go downtown much for a variety of reasons, but pedestrian traffic-starved streets are not that reason. Following the model of Victor Gruen, downtown business interests made a decision in the early 1960s to build skyscrapers and skyways and reinforced that decisions continuously. While I am not convinced building skyscrapers was economically wise, given skyscrapers and an arterial street network on which every street and avenue is an entrance or exit to a radial freeway, skyways are a reasonable way to connect buildings. In economic jargon, while no cars downtown might be a “first-best” solution for pedestrians, we don’t live in that world. Given the world where cars dominate streets, a pedestrian-only level is a viable “second-best” solution. Why should all of the modes interact on all levels. In principle, I like shared space as much as anyone, but I don’t like walking on a sidewalk next to 3 or 4 or 5 lanes of motorized traffic, why should I be confined to a narrow building hugging strip rather than travel on a strictly pedestrian level. Tall buildings should generate sufficient traffic to support retail on both the street level and the internal skyway level. In Planning for Place and Plexus we have a box “Ground Floor Retail Everywhere” which estimated that if all retail trips were home-based, 10 story apartment buildings would be sufficient to generate 1 floor of retail. A similar calculation could be done for non-home based (i.e. work-based) retail trips, and given the higher density of people per square foot in office buildings, should generate similar numbers. Short buildings don’t justify skyways, but tall buildings do. 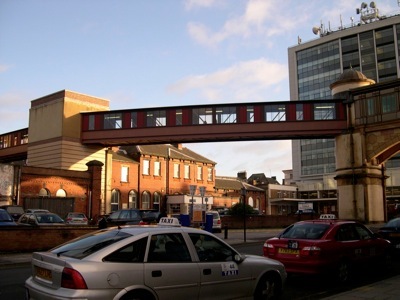 Skyways reduce inter-building transportation costs. This should increase inter-building activity and thus economies of agglomeration. Given the only purpose of cities is to connect people at low cost for some mutual advantage, the better cities connect people, the better off everyone is. I have coauthored two papersabout their evolution, I encourage you all to read the first: Corbett et al. (2009)Evolution of the second-story city: the Minneapolis Skyway System. Environment and Planning B: Planning and Design volume 36, pages 711 – 724, which goes into the history of the Minneapolis system. First, they can better connect to the street network with staircases or lifts adjacent to the sidewalks. Second, they can follow a more regular topology. More importantly the internal skyway level network inside the buildings themselves could be far more navigable than it is. While it is fine for regular commuters who learn the ins and outs, its medieval labyrinth is horrible for the unfamiliar traveler. Third, perhaps the skyway level should be on the 10th or 20th floor instead of the 2nd (The Petronas Towers at Kuala Lampur puts them at the 41st floor). This would require more coordination, but may be more useful in reducing the total amount of vertical movement required for inter-building personal transportation. 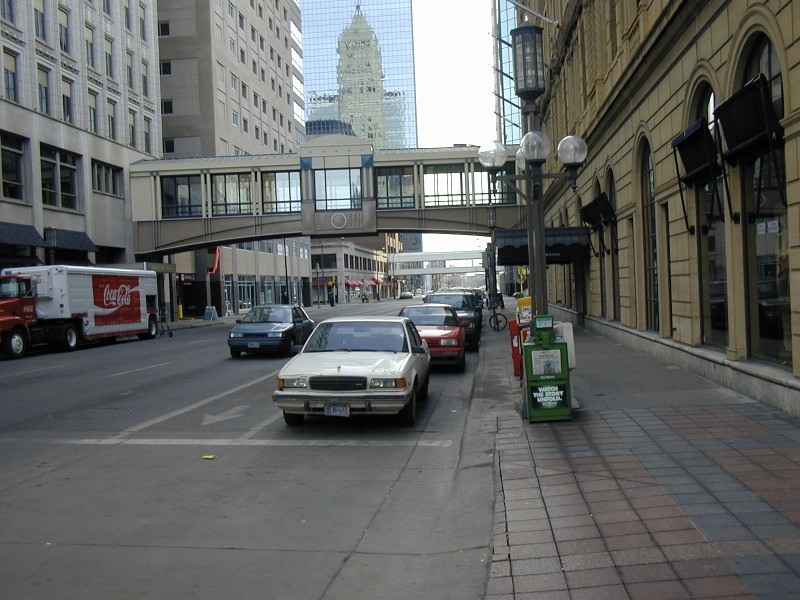 It is probably a bit late to retrofit Minneapolis, but should be considered in cities newly adopting skyways. Skyways are Minneapolis’s Cable Cars, our London Underground or Route-Master Bus, our Venetian Canals. Skyways are the iconic transportation system of Minneapolis. With all else (roads, LRT, etc.) we are copy cats. We need to embrace skyways as such, and not listen to others who want Minneapolis to fit into the conventions of relatively weather-less European cities. Price Roads A new blog about one of our favorite subjects. “Pedestrians have sometimes felt neglected when it comes to GPS directions. Indeed, not so long ago, one lady sued Google because the directions its map offered led her (she believed) to be struck by a car. Now Microsoft has been granted a patent that is designed to make its maps more pedestrian-friendly. Somehow, this patent has immediately been dubbed the “avoid ghetto” feature. “Since the Peer Review Group report is curiously still not available on their website (but you can email them for a copy) I thought a summary of their analysis would be useful. Here, concisely as I can, are the key points, with some commentary. The draft business plan relies on ‘illustrative’ concepts not decisions by the CHSRA. There is no identified funding for the plan presented. The biggest risk is system integration, but the plan requires all integration to happen very late in the project. The first section can be completed within budget and on time despite a lack of construction experience, managerial resources, and potential delays from lawsuits. The $24-$30 billion still needed to connect the first section to either San Jose or San Fernando valley when the state is the only likely source, and is broke. That the cost once up and running will be on budget, ridership will be close to estimates, and an inexperienced CHSRA can manage all the tricky integration issues. All these same things will be true of adding the next part of the system, including another $14-$35 billion.